» Why study economics? - Why Study Economics? Up: Home > Your ambitions > Why study economics? There are many reasons to study economics- from the huge range of skills you will gain, to the exciting types of employment you will be geared for. 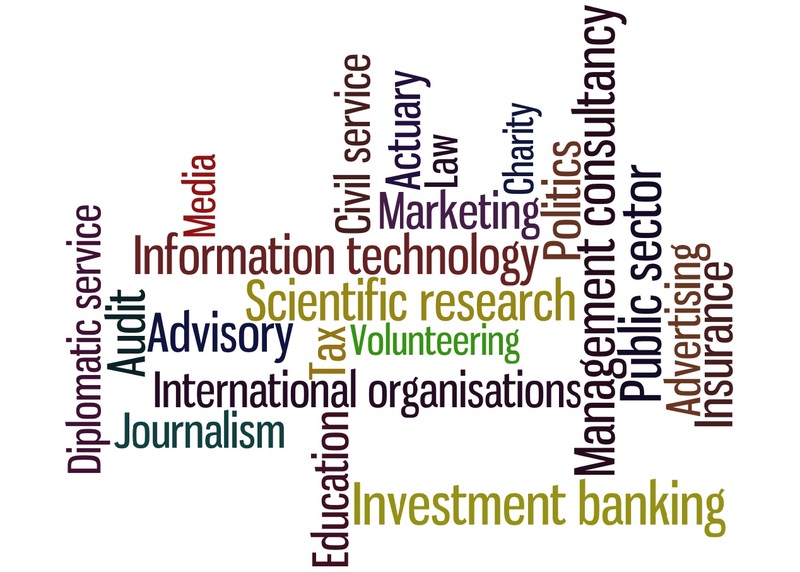 For example, our careers cloud identifies the most popular careers you can pursue with an economics degree. You can also look at our page on the types of skills an economics degree will give you. It is worth noting that salaries for economics graduates are among the highest of any discipline. Different research tends to find different starting salary values but it emerges that economics graduates are comparatively very well paid. The Institute for Fiscal Studies found that economics is the second most lucrative degree subject after using anonymised tax data and student loan records for 260,000 students up to ten years after graduation. It is estimated that around 12% of male economics graduates earned above £100,000 some ten years after graduation; by contrast, 6% of those studying medicine or law earned more than £100,000. In terms of females, it is estimated that around 9% of economics graduates earned above £100,000 some ten years after graduation; by contrast, just 1% of those studying medicine and 3% of those studying law did so (Institute for Fiscal Studies). It is good to remember that, as Professor Karen Mumford at the University of York put it, “Economics has a very broad application base: economics graduates can easily find jobs in the civil service, the City, industry or education…if you want to make a difference you can. If you don’t want to make a difference, at least you can make a lot of money”. James McCullagh, runner-up in the 2011 Young Apprentice series on the BBC, has written a short piece on why students should study economics. For me, economics is about the world around us; it’s current; it’s always changing; it’s always interesting. It’s the subject that allows you study Tesco’s and ASDA’s methods of competition one day, and learn about the environment and pollution permits the next. It’s about the modern world; it’s about how we behave, how businesses behave and how the government behaves. Economics teaches how to make well-informed decisions. A large part of the subject is decision making: what should the government do to cut the budget deficit; what should a business do to raise profit margins. It teaches us how to go about making choices, which is vitally important in business. I am of the belief that everyone needs to know what is going on in the world. How can you make decisions like what to do for a career, what to invest your money in or what bank to use, without having some knowledge about the economy? Through studying economics, you develop a financial awareness that is extremely beneficial, no matter what your career aspirations may be. Indeed, economics is a great foundation for many careers. Personally, having a keen interest in business, economics has helped immensely. It shows employers that I am interested in the economy, that I have an understanding of how a business works and that I know how to analyse markets. The subject looks impressive on your CV as it displays high levels of both analytical and communication skills and many of the large companies I have spoken to after my experience on The Young Apprentice have said just how important economics is in this current climate. I have also spoken to doctors, taxi drivers and hairdressers who have told me how important an understanding of the economy is to their careers. I spent eight weeks taking part in The Young Apprentice 2011. It was during this time that I realised what economics really meant to me. It’s not just looking at graphs, analysing statistics and predicting growth. It’s about how you think and it is an invaluable source of knowledge in the business world. James, 17, is currently studying for A-levels in English, Spanish, Biology and Economics in County Derry, Northern Ireland. He describes economics as his passion and he got the joint highest score in Northern Ireland in the subject at GCSE.